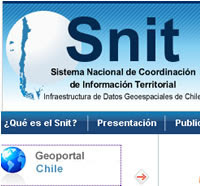 Here's another good SDI portal in the Latin American & Caribbean Region - SNIT - the National System of Coordination of Territorial Information of Chile, with an online map viewer and linkages with other sources of Chilean geospatial information. It's in Spanish of course, but still very understandable as an example of what the Region needs more of - spatial data/ information that's easily available to the public. And this one has been around a few years now. Here's a quick summary in English. GPS - is the sky falling?